Jane Zhanf of Silk Wings Aviation (see note), an aircraft consulting firm, commented on an earlier post about the RX1E, an airplane designed by Shenyang University students and demonstrated at two airshows over the last two years. Similar to the Yuneec (GreenWings) E430, it is a totally different design. 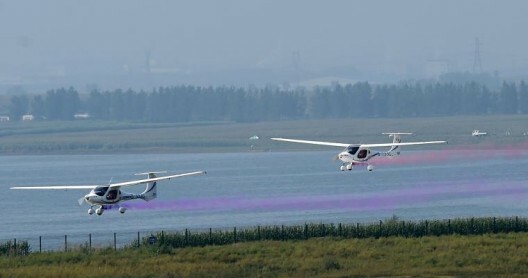 A two-electric airplane formation, complete with airshow smoke. AirVenture 2013 had two GreenWings single seaters flying formaton. “CAAC (Civil Aviation Administration of China) just awarded[a]TDA (Type Design Approval) to them! The European Aviation Safety Agency (EASA) has apparently allowed flights by the Pipistrel WattsUp at the Blois, France fly-in last year and demonstrations by Tine Tomazic at the airplane’s home field in Slovenia. The Federal Aeronautics Administration currently doesn’t interfere with users flying single-seat electric aircraft, but does prohibit flight by two-seaters. This will have to be sorted out before planned instructional aircraft from Airbus, Pipistrel and Aero Electric Aircraft Corporation become common sights in our skies. It is interesting that China has led the U. S. in this innovative arena. “I looked recently and couldn’t find any evidence that the draft update to 8130.2 (prohibiting carrying passengers in electric aircraft) has been made final. There’s still a bit of fog over this issue that’s important to those of us in the electric aircraft movement. You’re almost right. The FAA will allow single-seat aircraft, but not two-seaters, and you cannot certificate even a single-seater as E-LSA or S-LSA. Also, no-one operating under Sport Pilot privileges can fly an aircraft with an electric motor, even if it is normally certificated and otherwise meets the light-sport definition. A consequence of this is that if AEAC is able to certificate its electric trainer, pilots flying on Sport Pilot privileges will not be legal to fly them. Thanks for the note. Sorry I misspelled my own name typing on my phone. I was quite surprised that CAAC not only recognizes F2840 but allows it to be part of SLSA TDA process. I checked CAAC TDA rules for LSA dated Jan 2014 (AP-21-AA-2014-37), in deed F2840 was mentioned. From the dates on TDA approval, RX1E applied back in Nov 2012, so it seems that it took CAAC a while to incorporate F2840 into LSA TDA process, but it did. I have a copy of RX1E TDA approval if anyone is interested to see. Mr. Yang, the head of this project is a well known and well connected airplane designer in China.